Cisco-Eagle Catalog - Non-Telescoping Economy Lift Boom - 13&quot;H, 82&quot;L, 4,000 lb. Cap. Forklift Accessories > Forklift Boom Cranes > Non-Telescoping Economy Lift Boom - 13"H, 82"L, 4,000 lb. Cap. Non-Telescoping Economy Lift Boom - 13"H, 82"L, 4,000 lb. Cap. When materials can't be put on a pallet but must be moved from one location to another, your fork truck can do the job with this fork mounted economy non-telescoping lift boom. 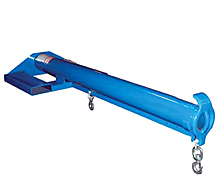 Made from welded structural steel that satisfies AWS (American Welding Society) standards, this boom features a 4000 lb. uniform capacity, 82" span, and safety restraints to secure boom to fork truck. Two lifting hooks are included. Non-Telescoping High-Rise Boom - 79"H, 51"L, 4,000 lb. Cap.